N FR. ZUHLSDORF’S memorable phrase, the liturgy is the “tip of the spear” in the battle against modernism and secularism. It is where our Catholic identity is forged and deepened. If we want to become all that we are called to be as Catholics, the first thing to pursue is the worship of God “in spirit and in truth”―and that means not only with personal humility and doctrinal truth, but also with the institutional humility to maintain continuity with the heritage handed down to us, and to recover it whenever and wherever is has been lost. One vexing problem, however, is this. Patiently, over the years of his glorious pontificate, Pope Benedict XVI has asked us, in his words and in his example, to recover continuity with the Tradition. But the hermeneutic of discontinuity is present at the very heart of the Ordinary Form―a form inherently discontinuous with the unbroken, organic tradition, as many liturgical theologians have argued, including then-Cardinal Ratzinger. It is a rupture of unprecedented magnitude in the history of the Church. Nothing like it has ever happened or will ever happen again. It marks the point at which the Church, for some mysterious reason known only to Divine Providence, suffered amnesia of her own past and parted with much of her sacred patrimony. This is the massive obstacle to restoration: when the Church herself appears to enshrine, canonize, inculcate rupture, how is the recovery supposed to take place sanely and peacefully? If, seeking solace and sacredness, we go back to the Extraordinary Form, that afford us an extremely good temporary solution―but it, too, is artifically isolated in 1962―a year already squarely within the period that had seen the first disastrous experiments of Bugnini and his minions (e.g., the 1955 Holy Week reforms, which show a deformative tendency). The Missal of 1962 is a rock of stability, no doubt about it; but it is also an island on which one cannot expect to camp out permanently. How is this Missal to become a living Missal again, not one frozen in 1962? And the moment we ask that question, the floodgates of discontinuity are once more flung open, as this expert and that expert step forward with their proposals about how to modify the ‘62 missal in accordance with Sacrosanctum Concilium or many another Vatican instruction. Some will clamor for vernacularization, others for more readings and prefaces, still others for rubrical simplifications, and soon a cacophony of changes will threaten to drown out the sweet and sober music that the old Missal has only just begun to restore to us. 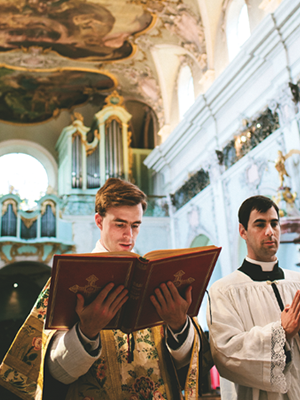 In short: as Martin Mosebach once observed, the curse of the era of liturgical reform is that we are all self-conscious reformers with as many strategies and programs as there are heads on shoulders. Few, it seems, are content with Tradition as it stands, and no one who understands liturgical theology and history can be content with the experiment of the Novus Ordo. No one knows exactly when a chaste love of reform became an unbridled passion for rupture. Some think Pius X is to blame with his major modifications of the Roman Breviary. Others would blame Pius XII for entrusting key liturgical reforms to soft modernists, or John XXIII for his temerarious, although in retrospect miniscule, change to the Roman Canon. Most would squarely blame Paul VI. Do we not see all along a papal predilection to overreach, to indulge a monarchical Petrine power of modifying the liturgy when they should be its foremost preservers? Should not the popes, above all, see themselves as servants of what has been handed down, rather than judges of its supposed defects? Paul VI thought he could abolish the traditional Mass with a stroke of the papal pen. Time has proved the vanity of his intention. All over the world, in every corner, the Mass of the Ages is rising again. And the irony is that the internet has become a major tool for the success of this movement of restoration―the restoration of a liturgical tradition that long predates the technology of the printing press, let alone any electric or electronic machinery. In this convergence of the very old and the very new there is both pathos and humor. The divine, the sacred, the holy, cannot be buried, cannot be banished, cannot be bartered away. The voice of the Church at prayer cannot be silenced. It will, in due time, re-emerge, erupt anew, wherever it may have been suppressed. We are just beginning to see the Catholic renaissance, even while the rest of the modern Western world rushes at a mad pace to populate the circles of hell. Whatever mistakes have been made, whatever colossal errors and breathtaking blunders, we ourselves who love the Church and her Tradition must “keep calm and carry on,” cherishing, defending, and promoting the precious inheritance we, all unworthy, have received.